After graduating from Bauhaus University in Weimar and the Architectural Association in London, Florian Busch worked for Toyo Ito & Associates from 2004 until 2008 where he led several teams on projects such as the Ghent Forum for Music, Dance and Visual Culture, the Torres Fira in Barcelona, the Market Street Tower in Singapore, the Taichung Opera House. In 2009, he founded Florian Busch Architects, an office practicing architecture, urbanism, and socio-cultural analysis. Based in Tokyo, FBA flexibly draw on an extensive world-wide network of experts in the field of construction and design. FBA’s projects range from research & analysis to architecture at all scales. 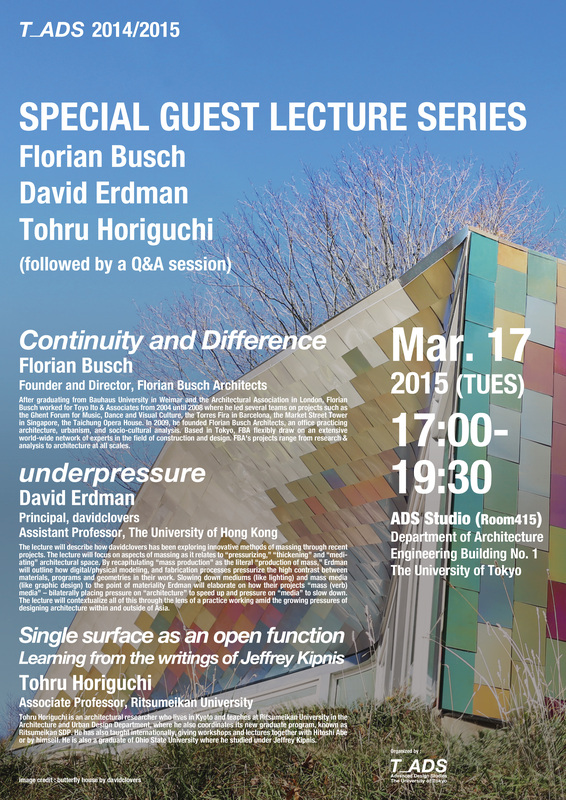 The lecture will describe how davidclovers has been exploring innovative methods of massing through recent projects. The lecture will focus on aspects of massing as it relates to “pressurizing,” “thickening” and “mediating” architectural space. By recapitulating “mass production” as the literal “production of mass,” Erdman will outline how digital/physical modeling, and fabrication processes pressurize the high contrast between materials, programs and geometries in their work. Slowing down mediums (like lighting) and mass media (like graphic design) to the point of materiality Erdman will elaborate on how their projects “mass (verb) media” – bilaterally placing pressure on “architecture” to speed up and pressure on “media” to slow down. The lecture will contextualize all of this through the lens of a practice working amid the growing pressures of designing architecture within and outside of Asia. Tohru Horiguchi is an architectural researcher who lives in Kyoto and teaches at Ritsumeikan University in the Architecture and Urban Design Department, where he also coordinates its new graduate program, known as Ritsumeikan SDP. He has also taught internationally, giving workshops and lectures together with Hitoshi Abe or by himself. He is also a graduate of Ohio State University where he studied under Jeffrey Kipnis.